SZA's first solo album is a confessional look at her psyche through previous relationships. Bolstered by powerful production its as resonant and sure-footed of an R&B debut as any this year. 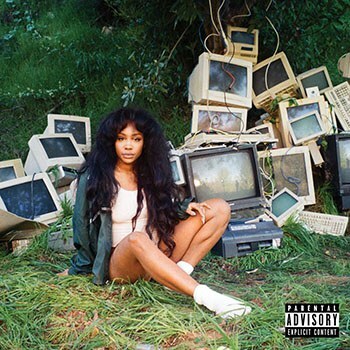 After a turbulent start to her career dotted with album delays, SZA stakes her claim as a vital voice both within Top Dawg Entertainment and the entire R&B realm on CTRL, an unflinching, slice-of-life debut buoyed by rich production. Less alt-R&B and more millennial neo soul, (meaning the instrumentation is rich and vibrant, not shadowy and submerged) it’s an album that genuinely feels like SZA’s singular vision, which is eye-opening for those who may be more familiar with the New Jersey singer as a guest vocalist. Take the early single “Drew Barrymore,” which takes the same concept as Alessia Cara’s cloying “Here” -- discomfort at a social gathering -- and packs it with specificity and emotion that makes the circumstance feel even more visceral. “Why is it so hard to accept the party is over? / You came with your new friends / And her mom jeans and her new Benz / And she’s perfect, and I hate it, oh so glad you made it,” SZA sings on the opening verse, painting a picture that is both cinematic and quotidian. Another clear winner is “Broken Clocks,” a record about the symbiosis of work and love troubles built atop an ascendant sample of River Tiber’s “West". “Got a shift at 10 AM / Gotta dip at 10 PM / Gotta get that cash / Won't get past the lunch break / I ain't had a smoke break / In about two days don't break,” she sings with palpable weariness. Despite a nonsensical Kendrick Lamar verse, “Doves in the Wind” soars, with SZA affecting an airy cadence that meshes gorgeously with Cam O’bi’s instrumental. The song is a response to the selfish ex-lovers she frequently challenges on the record, but it’s also a rebuke of the sexual rhetoric in hip-hop and R&B (exemplified with one particularly clever Forrest Gump reference). If there’s a second star on CTRL it’s the guitar that gives tracks like “Supermodel", “20 Something", and “Drew Barrymore” their diary entry authenticity. Though none of the fretwork is technically stunning, there’s a DIY quality, almost amateurism, that just heightens the stakes of every track. In fact, there’s a fascinating cycle created between the album opener, “Supermodel", and the closer (akin to Kendrick’s Good Kid, M.A.A.D. City). Both are bare-bones and confessional, but the former’s cutting introspection is couched in the reproach of an ex. “20 Something” is more vulnerable, and less confrontational, making it especially devastating. Making these subtle tonal shifts so impactful is a truly rare feat for a debut record and proves that SZA already has a place among our most heart-wrenching writers and vocalists.